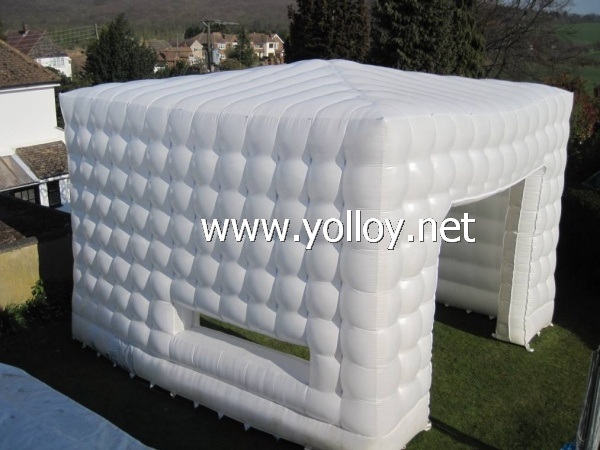 This white cube tent is with double layers, the bubble effect make the whole temporary tent good looking. This tent is easy up, you just need to link the blower to power and tent, turn on the swift, the whole tent will stand up. Here the details for this small white meeting room. 1) The specialy roof design can make sure the rain be flow down better, not like the flat roof which the middle part is easy to collapse when in rain wether. For this roof design, no worry for this issue. 2) Meterial we used for this tent is PVC tarpaulin, so it can be much easy to clean when it is dirty. 3) We can make this tent customized size, also can be with client's logo printing on it. If you need to make smaller or bigger size or change tent color, we can accept. Any requirements, please feel free to let us know.